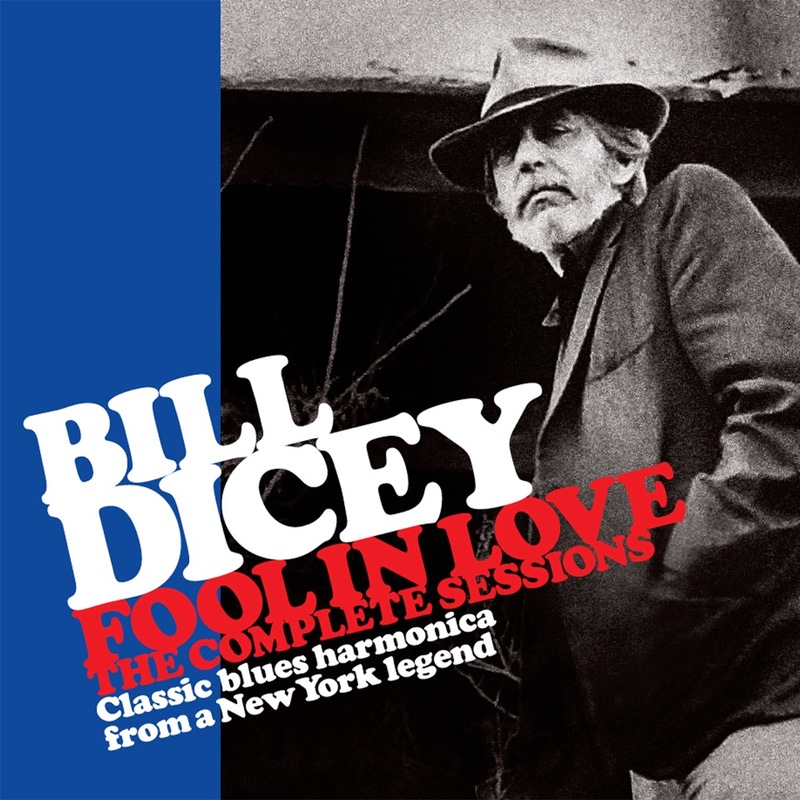 Bill Dicey’s playing here is simply superb... a straight down the line ‘traditional’ electric style... the whole set is unpretentious real blues. Recorded: Samurai Studio, London 1987. Engineer: Jack Ezra. Bonus tracks: Musicians as original session. Recorded: BBC Studios, Maida Vale, London in 1987. I knew Bill’s playing from some of those legendary Louisiana Red sessions, but also Red himself had told me that Bill was one of the good guys. So that was an immediate “YES”. I can’t remember if we met before the session or what was happening around it, but I do recall that I booked a very nice, small but perfectly formed, studio close to Borough High Street in London. A perfect space for this kind of music with a great engineer. Richard Studholme had picked a couple of superb musicians for the rhythm section and he himself turned out to be a revelation. Those years playing clubs and dives in NYC had turned him into a world class blues guitarist with a lovely feel and a real knack as an accompanist. Bill’s playing here is simply superb, straight down the line ‘traditional’ electric style and the whole set is unpretentious real blues. Note the nice studio sound with properly recorded drums and no attempt to turn it all into a rock session. The final three tracks were recorded at a BBC Radio session and are bonus tracks not on the original vinyl release. The contrast in the audio approach is fascinating. A ‘rockier’ drum sound, all a bit heavier and of course recorded in a big room. At the time of the original release I was in a period of transition between vinyl LPs and CDs, and I think that was one of the very last vinyl releases I did. I don’t know if Bill thought that a CD release was too limiting, or if I was busy putting out some of my well known albums as CDs, but anyway over 30 years later I remedy that! As something of a postscript, shortly after the release of this album I was touring Carey Bell for the first time and naturally wanted to make an album. He was very reluctant to record again with English musicians, but I played him this album. After track one he smiled a little, after track two he was beaming broadly and nodding. “YES” we were going to make an album – with Richard Studholme again of course – and that was the classic ‘Harpslinger’ album. Richard continued to record many sessions for me – Hubert Sumlin, Mojo Buford, Lucky Lopez Evans, Larry Johnson and Louisiana Red come to mind. “I’m sure that Bill won’t mind when I say that, like some actors, he spent the last 20 years arriving. The journey may have taken a long time, but the distance travelled has not been that far. For during that time he’s worked hard and long in bands and bars, with stars and without, but always with dedication to the music he loves. And good musicians, like the best wines, are those that take their time to mature. Welcome to a case of Maryland ‘36. Don’t ask me if that was a good year for Bordeaux, but it happens to be a good one for harmonica players. Or perhaps we should change that to 1939, for that’s when Bill remembers first playing the instrument. Maryland didn’t notice its three-year-old infant prodigy at that time, and it wasn’t until five years later that Bill took a serious interest in learning to play. His father handed down a Hohner Marine Band which his son took out into the steets of their neighbourhood which, being the poor part of town, meant that Bill soon fell in with the black musicians playing on porches and street corners. From them he learned how to ‘cross’ the harmonica so that up to five different keys could be played on one instrument. By the middle of his teens Bill had learned the drums and was playing in an otherwise all-black band that specialised in the R&B hits of the day. Occasionally a famous musician would pass through and sit in, and Bill remembers the nights with Sonny Boy Williamson (Rice Miller). The whole band was drafted in 1953 and Bill went into the Air Force. Unfortunately, when they all returned to civilian life enthusiasm for the band had waned and in 1959 Bill gave up playing completely. During the mid-60s Bill moved to Atlanta and contact with the local musicians inspired him to buy another harmonica. By now his influences had broadened, for aswell as Little Walter, Jimmy Reed and Rice Miller, he was lending an ear to reedmen like Clifford Scott and David ‘Fathead’ Newman. But his next association came from a much older tradition, for Bill teamed up with Buddy Moss to form the Atlanta Blues Band. This very successful partnership toured the colleges and clubs of the south for several years before Buddy retired and left the band in Bill’s capable hands. One of another band’s tours ended in New York, where they performed as the backing band for the ‘First Generation Blues Festival’ at the Electric Circus. Bill stayed on in New York and joined John Hammond’s band for a while. Then Muddy Waters, for whom the Atlanta Blues Band had opened on one of Muddy’s tours, introduced Bill to Victoria Spivey. By the beginning of the Seventies Victoria’s eponymous label was a thriving cottage industry and Bill soon became an important member of Spivey’s ‘house band’. Over the next few years he recorded with Roosevelt Sykes, Big Joe Turner, Lloyd Glenn, Washboard Doc, Louisiana Red, Sugar Blue and Eunice Davis. He also had his own album released, taken from live sessions at Dan Lynch’s Bar and Grill. Bill was first heard on JSP accompanying Pinetop Perkins, but the present album represents his solo debut in this country. The first thing that you’ll hear is that though Bill is more than ready to catalogue his influences, his playing no longer reveals any more than a vestige of their various styles. Take ‘Americana’ for instance, where his inventiveness never falters. But then the same applies to the tour de force numbers that close both sides, ‘To Poor To Die’ and ‘Sail On’, where you could say that the shades on Muddy and Little Walter are invoked, but the music is all Bill’s. One of the artists that Bill had backed at the Electric Circus was Slim Harpo, and the version of ‘Raining In My Heart’ that Bill gives here captures all the poignancy and delicacy of the original. ‘Lightning Bug’ is certainly reminiscent of John Lee ‘Sonny Boy’ Williamson, who also provided the inspiration for ‘Sleeping With The Devil’. The opening stomper, ‘Fool In Love’, has Bill sounding a bit like Billy Boy Arnold, but that’s only my opinion. It’s not an argument worth ‘Whoopin’ And ‘Hollering’ about, especially as Bill puts his case so well on the track that follows. Nor will I be in competition when it comes to ‘Wheeling And Dealing’, another stormer where sleight of harmonica almost defeats the ear.